Represent the above information by a pictograph. Let an icon of a T.V represent 50 T.Vs. Let one car icon represent 5 Maruti cars. Represents the above information by a pictograph. To represent the given data on a bar graph, we should first draw a horizontal and a vertical line. Here, the horizontal line will show the census year and the vertical line will show represent the population. Since 5 values or data are given, we mark 5 points on the horizontal axis at equal distances and will erect rectangles of the same width with their heights proportional to the given data. Also, on the vertical axis, each difference of 10 will represent a population of 10 lakhs. (i) What is the information given by the bar graph? 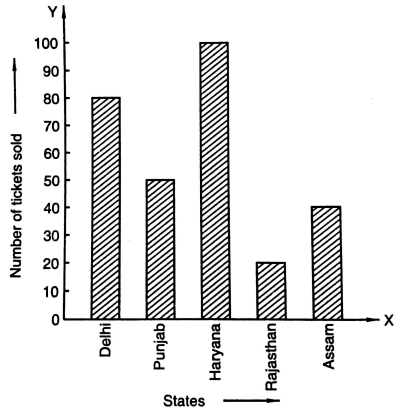 (ii) How many tickets of Assam States Lottery were sold by the agent? (iii) Of which state, where the maximum number of tickets sold? (v) of which states were the minimum number of tickets sold. (i) The bar graph represents the number of tickets of different states lotteries sold by an agent on a single day. (ii) The agent sold 40 tickets of Assam state lottery. Explanation: The vertical height of the rectangle against Assam, on the bar graph, has ended on the 40th mark against the vertical axis. Explanation: The vertical height of the rectangle against Haryana I the maximum compared to those against the other states. Explanation: From the bar graph we can say that the Rajasthan State Lottery tickets were sold the minimum i.e. only 20 tickets. (i) What is the percentage of the youngest age – group persons over those in the oldest age group? (ii) What is the total population of the town? 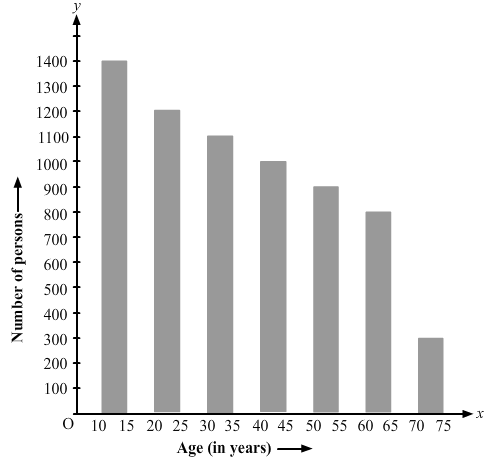 (iii) What is the number of persons in the age group 60 – 65? (iv) How many persons are more in the age – group 10 -15 than in the age group 30 – 35? (v) What is the age – group of exactly 1200 persons living in the town? (vi) What is the total number of persons living in the town in the age – group 50 – 65? (vii) What is the total number of persons living in the town in the age – group 10 – 15 and 60 – 65? 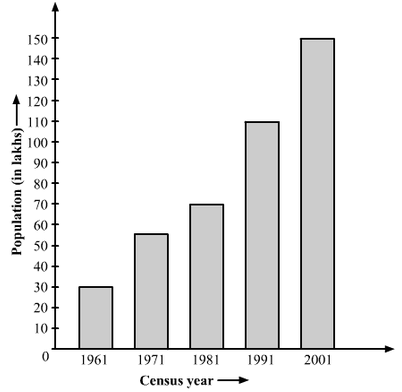 (viii) Whether the population in general increases decreases or remains constants with the increase in the age – group. (i) The youngest age group is 10 – 15 years. The oldest age group is 70 – 75 years. Therefore, The youngest group has 1100 more people than the oldest group. = 1400 + 1200 + 1100 + 1000 + 900 + 800 + 300 = 6700. (iii) There are 800 persons in the age group 60 – 65 years. Explanation: The vertical length of the rectangle against the age group 60 – 65 is up to 800 units. Therefore, number of more persons in the age group 10 – 15 as compared to that in the age group 30 – 35 = 1400 – 1100 = 300. (v) the age – group of exactly 1200 people living in the town is 20 – 25 years. Explanation: Looking at the bar graph we can say that the vertical length of the rectangle against the age group 20 – 25 is up to 1200 units. (vi) The number of people of the age group 50 – 55 years is 900. Explanation: The vertical length of the rectangle against the age group 50 – 55 years is up to 900 units. (vii) The number of persons in the age group 10 – 15 years is 1400, and that in the age group 60 – 65 years is 800. (viii) With the increase in the age group, the population decreases. Explanation: As the age group increases, the heights of the rectangle start falling. (ii) What was the number of commercial banks in 1977? (iii) What is the ratio of the number of commercial banks in 1969 to that in 1980? The number of commercial banks in 1983 is less than double the number of commercial banks in 1969. (i) The bar graph represents the number of commercial banks in India during the respective years. (ii) In 1977, there were 130 commercial banks. Explanation: The height of the rectangle against the year 1977 is up to 130 units. As 230 is greater than 180, the number of commercial banks in 1983 is not less than double the number of commercial banks in 1969. (i) It is decided to distribute workbooks on mathematics to the students obtaining less than 20 marks, giving one workbook to each of such students. If a workbook costs Rs. 5, what sure is required to buy the workbooks? (ii) Every student belonging to the highest mark group is entitled to get a prize of Rs. 10. How much amount of money is required for distributing the prize money? (iii) Every student belonging to the lowest mark-group has to solve 5 problems per day. How many problems, in all, will be solved by the students of this group per day? (iv) State whether true or false. (a) 17% students have obtained marks ranging from 40 to 49. (b) 59 students have obtained marks ranging from 10 to 29. (v) What is the number of students getting less than 20 marks? (vi) What is the number of students getting more than 29 marks? (vii) What is the number of students getting marks between 9 and 40? (Viii) What is the number, of students belonging to the highest mark group? (ix) What is the number of students obtaining more than 19 marks? Let us prepare a chart of the 100 students using the data from the bar graph. Therefore, Required sum to buy the workbooks = Rs 5 × 39 = Rs 195. Therefore, Required money to distribute the prize = Rs 10 × 17 = Rs 170. Therefore, Number of problems that will be solved by the students per day = 5 x 27 = 135. 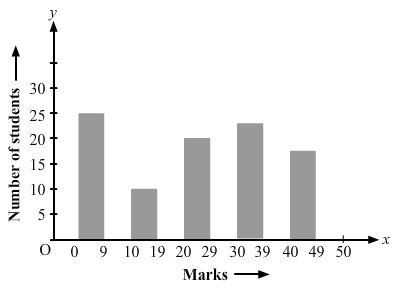 (v) Number of students scoring less than 20 marks. (viii) The highest marks group is 40 - 49. (ii) State each of the following whether true or false. (a) The number of government companies in 1957 is that of 1982 is 1: 9. 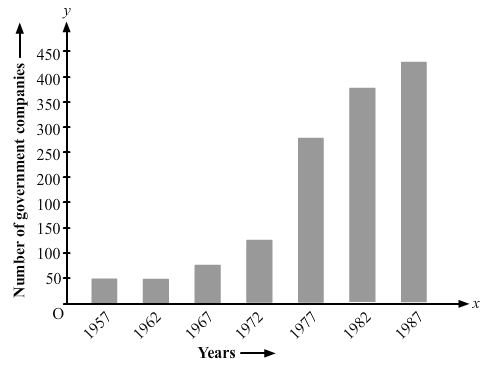 (b) The number of government companies has decreased over the year 1957 to 1983. 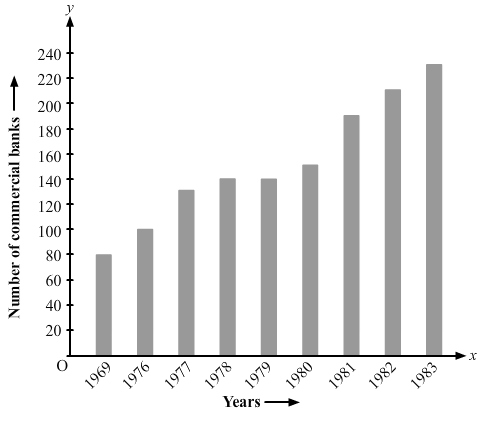 (i) The bar graph represents the number of government companies in India from 1957 to 1987. Explanation: As no data is given for the year 1983, we cannot tell anything about this. Hence, the given statement is false. (i) What information is given by the bar graph? (ii) Which state is the largest producer of rice? (iii) Which state is the largest producer of wheat? (iv) Which state has total production of rice and wheat as its maximum? (v) Which state has the total production of wheat and rice minimum? 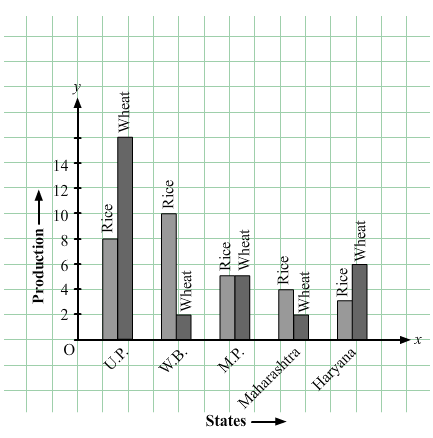 (i) The above bar graph provides information on the production of rice and wheat in various states of India. (ii) W.B. is the largest producer of rice. Explanation: The height of the rectangle representing rice production in W.B. is up to 10 units, i.e., the highest compared to those in the other states. (iii) U.P. is the largest producer of wheat. Explanation: The height of the rectangle representing wheat production in U.P. is up to 16 units, i.e., the highest compared to those in the other states. (iv) U.P. has the total production of rice and wheat as its maximum. Explanation: From the bar graph we can say that U.P. exceeds the other states in the total production of rice and wheat, i.e., 16 units wheat + 8 units of rice = 24 units. (v) Maharashtra has the total production of rice and wheat as its minimum. Explanation: From the bar graph we can say that the total production of rice and wheat in Maharashtra is the minimum, i.e., 4 units rice + 2 units of wheat = 6 units. (i) What percentage of the total number of students have their heights more than 149 cm? (ii) How many students in the class are in the range of maximum height of the class? (iii) The school wants to provide a particular type of tonic to each student below the height of 150 cm to improve his height. If the cost of the tonic for each student comes out to be Rs 55, how much amount of money is required? (iv) How many students are in the range of shortest height of the class? (a) There are 9 students in the class whose heights are in the range of 155-159 cm. (b) Maximum height (in cm) of a student in the class is 17. (c) There are 29 students in the class whose heights are in the range of 145-154 cm. (d) Minimum height (in cm) of a student is the class is in the range of 140-144 cms. (e) The number of students in the class having their heights less than150 cm is 12. (f) There are 14 students each of whom has height more than 154 cm. Explanation: From the above chart we can say that the number of students in the height-range 155 — 159 is 9. Explanation: 17 is the number of students found in the maximum height-range, i.e., 160 — 164. Explanation: The minimum height-range of the students in the class is 140 — 144 cm. 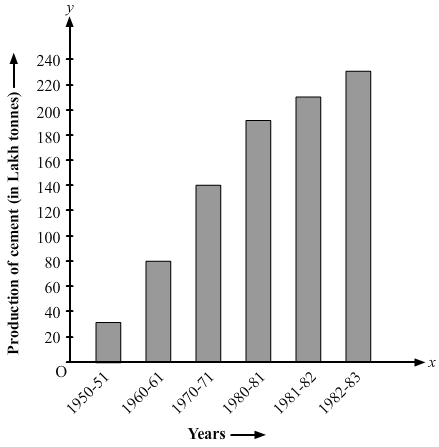 (ii) What was the production of cement in the year 1980 – 81? (iii) What are the minimum and maximum productions of cement and corresponding years? (i) The bar graph informs us about the industrial production of cement in India in different financial years. (ii) 186 lakh tones of cement were produced in the year 1980 – 81. Explanation: The height of the bar against the year 1980 — 81 is up to186 units, and production of cement is shown in lakh tones. (iii) Minimum height of a bar is 30 units against the year 1950 — 51. Therefore, Minimum production of cement is 30 lakh tonnes in the year 1950 — 51. The maximum height of a bar is 232 units against the year 1982 — 83. Maximum production of cement is 232 lakh tonnes in the year 1982 — 83. (i) What is the total number of newspapers published in Hindi, English, Urdu, Punjabi, and Bengali? (ii) What percent is the number of newspapers published in Hindi of the total number of newspapers? (iii) Find the excess of the number of newspapers published in English over those published in Urdu. (iv) Name two pairs of languages which publish the same number of newspapers. (vi) State the language in which the largest number of newspapers is published. 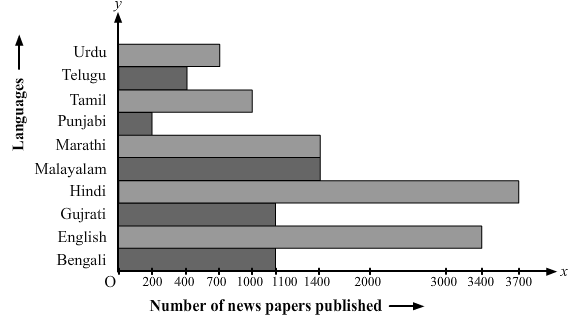 (vii) State the language in which the number of newspapers published is between 2500 and 3500. (a) The number of newspapers published in Malayalam and Marathi together is less than those published in English. (b) The number of newspapers published in Telugu is more than those published in Tamil. (iv) “Marathi” & Malayalam” and “Gujarati & Bengali’ are the two pairs of languages in which same number of newspapers are published. (v) Punjabi is the language in which the least number of newspapers are published. Explanation: In Punjabi, only 200 newspapers are published. (vi) Hindi is the language in which the maximum numbers of newspapers are published. Explanation: In Hindi, 3700 newspapers are published. (vii) The number of English newspapers published is between 2500 and 3500. Explanation: In English, 3400 newspapers are published. The number of newspapers published in English are 3400, which is more than the total numbers of Malayalam and Marathi newspapers.